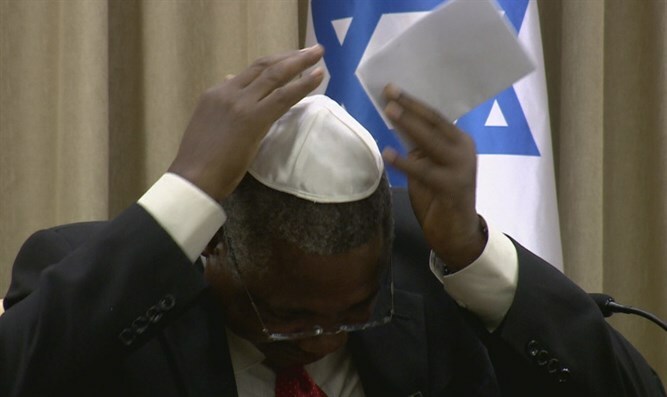 Job Daudi Masima, Tanzania's first ambassador to Israel, dons kippah, greets Israeli President Reuven Rivlin with Hebrew prayer. President Reuven Rivlin welcomed four new diplomats to Israel in a ceremony on Thursday, receiving their diplomatic credentials at the President’s Residence in Jerusalem. New ambassadors from Nepal, Honduras, Brazil, and Tanzania met with President Rivlin, marking the formal beginning of their service in Israel. This marks the first time ever that Tanzania, an east African country of some 52 million, has an active embassy in the Jewish state. Israel and Tanzania established diplomatic ties in 1995, following a 22-year hiatus which began during the Yom Kippur War, though no ambassador from Tanzania was ever sent to Israel. During an east African summit in Uganda however, Tanzania’s Foreign Minister, Augustine Mahiga informed Prime Minister Binyamin Netanyahu of his country’s plans to finally open a full embassy in Israel. In his meeting with Rivlin, Ambassador Masima donned a kippah and recited the Shehecheyahu prayer, the blessing said on new occasions, in Hebrew to mark the beginning of closer ties between the two countries. “We are making history,” said Rivlin.